The required modules can be pre-installed at the plant. Upgrading can be easily done on the operating network on-site directly. 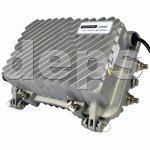 Cost-effective platform with the ability to be upgraded to the optical node. 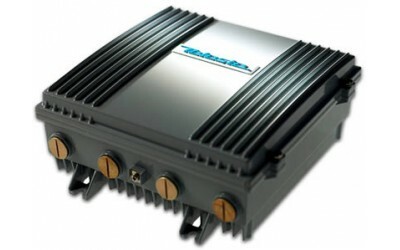 Powerful trunk amplifier on the GaAsPD technology with a high output level. Output signal can be split by the insert of the 2 RF-output splitter or couplers. 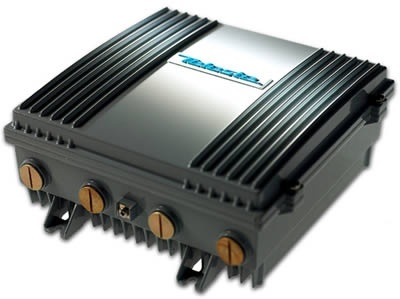 2 main outputs with the passage of remote supply current up to 8 A. Different types of plug-in modules of optical receivers that are optimized for different levels of optical input power. Wide range of inserts of optical backward channel transmitters of 1310 and 1550nm, 8 types of transmitters with a DFB-laser and CWDM technology. • Possibility of injection of a test signal of the backward channel through control data points. Remote measurement of the key parameters: output voltage of a power supply unit, temperature in the case, input optical power, the current of a laser optical transmitter.